Nintendo will have a patch available to fix the bug in Lumiose City of Pokemon X and Y as soon as possible. Saving your game in certain areas of Lumiose City in Pokemon X and Y can cause a game-breaking bug in your game. Nintendo is working on a fix to the bug, which they will provide as a download from the eShop, but in the mean time there are ways to avoid the bug. In a post on the company's Japanese website, Nintendo said it will have a fix soon. 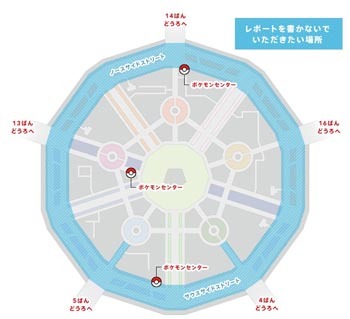 It provided a map of Lumiose City; saving your game in any blue-highlighted area could break your game and force you to restart. The blue-highlighted areas include North Boulevard, South Boulevard, the alley leading to Bleu Plaza, and the alley leading to Vert Plaza. Saving in buildings such as Pokemon Centers in the X and Y capital city should not prompt the bug. The fix will fix corrupted files, so if you caught the bug after many hours, you could wait until Nintendo releases the patch instead of restarting your game. This may not help people who have already lost their save files. Pokemon has had bugs before, but never as frustrating as this one. Make sure to avoid saving your game on the major boulevards of Lumiose City. The fix will be on the eShop as soon as it is ready, which Nintendo says should be in a few days. The company apologized for any inconvenience the bug has caused.